A Laravel notification channel for sending PagerDuty events. This package makes it easy to send notification events to PagerDuty with Laravel 5.3. Now you can use the channel in your via() method inside the Notification class. In order to let your Notification know which Integration should receive the event, add the routeNotificationForPagerDuty method to your Notifiable model. This method needs to return the Integration Key for the service and integration to which you want to send the event. 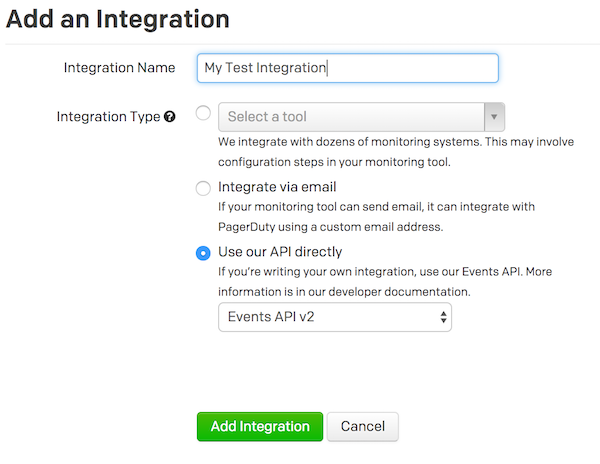 On a PagerDuty Service of your choice, create a new Integration using the Events API v2. The Integration Key listed for your new integration is what you need to set in the routeNotificationForPagerDuty() method. resolve(): Sets the event type to resolve to resolve issues. setDedupKey(''): Sets the dedup_key (required when resolving). setSummary(''): Sets a summary message on the event. setSource(''): Sets the event source; defaults to the hostname. setSeverity(''): Sets the event severity; defaults to critical. setTimestamp(''): Sets the timestamp of the event. setComponent(''): Sets the component of the event. setGroup(''): Sets the group of the event. addCustomDetail('', ''): Adds a key/value pair to the custom_detail of the event. See the PagerDuty v2 Events API documentation for more information about what these options will do. If you discover any security related issues, please email lwaite@gmail.com instead of using the issue tracker.